Anansi took the heat and put it in a pot and hung it in the silk cotton tree. That's why we have winter storms, I am sure of it. Hey, cool! A promo player with 4 sample tracks (though it looks like it doesn't travel by RSS feed or email subscription). From my latest poetry album: Starfire. A lit, white, outdoor patio curtain billows, and I, videotaping it, frighten the owner in my black hooded coat and huge Sorrel boots. The night blasts. Spring generates below the frozen ground. The green, the brown rising. Darkly. The stone, drawn from the stream-of-consciousness writing in the drawing. In the endless greys, browns, taupes and whites of winter, I seem to be deeply missing the green! My subconscious offering compensatory imagery - or that's what it seems. Buried in masses of green. While working on this drawing, I spilt half a bottle of olive green India ink, a colour that I had mixed from a sepia and a bright green, onto my La Cache tablecloth (the store no longer exists). That was a disaster. India ink is extremely permanent. Did I get it rinsed before doomsday in green? About 10 separate squirts of dish soap and rinses and me scrubbing with my hands. Finally I put it in a bucket with laundry detergent to soak. I would say there is a black and a white sister here. They are a study in contrasts. Two very different lives and takes on life. Yet they are the same woman. Your clay-whitened bodies covered with cracks like dry riverbeds on the surface of the moon. Cracked and dry as a desert. Denuded of identity, warmth, flush skin tones. No bright highlights, no glamour. Bodies risen from clay pools, an earthen pottery. No colour, erase difference. Frozen white ghosts on the edge of time, a sea of pale mud, a genesis. You are Adam and Eve, the beginning of all beginnings, or the end of all endings. Face each other, relinquish your loneliness. Your skin hardened like living statues in a dissolving Garden of Eden, the smeared powdered rock, breathing clay, imprisoned in your own beauty. One rich, round, ripe Sardinian olive. Green, stuffed with pimento, steeped and plucked from a pot of salt, garlic and oil. Redolent. I think we're going for a walk. My dog thinks we are going out to search for edible garbage. To lie down, pull the sheaves of powdered words over me, a bleached sheet of snow in the sun. 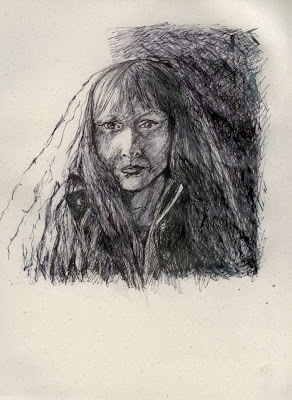 Self-Portrait, 2011, 20.5cm x 25.5cm, 8" x 10", archival, Rotring and India inks on archival paper. And it's not finished yet, I don't think. Or, who knows? Words, a poem, may appear, or not. Snow the quality of white weightless rocksalt falls. The ground silts with sifted snow, around the strewn rocksalt are meltspots. this page, though presently I have no idea what. 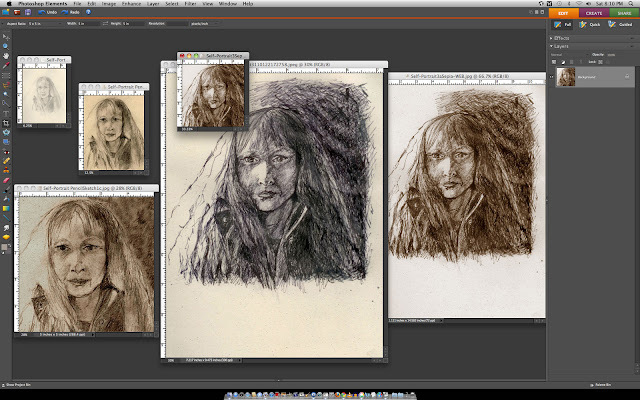 Screen shot of my Photoshop Elements page - thought this might be an interesting way to display the different stages of this drawing, from pencil to finished. The pencil sketch in upper left and the black and white center are the 'real' ones - a Sepia filter used with the others. A bit much, so many images of one drawing but...! With a wind chill of -21°c, I think the Westerly wind is angry and howling cold words against our cheeks, our bodies. Einsenstein criticises Griffith for...having conceived of...unity in a completely extrinsic way as a unity of collection, the gathering together of juxtaposed parts, and not as a unity of production, a cell which produces its own parts by division, differentiation; for having interpreted opposition as an accident and not as the internal motive force by which the divided unity forms a new unity on another level....Eisenstein retains Griffith's idea of an organic composition or assemblage of movement-images: from the general situation [situation d'ensemble] to the transformed situation, through the development and transcendence of the oppositions. But it is true that Griffith did not see the dialectical nature of the organism and its composition. The organic is indeed a great spiral, but the spiral should be conceived of 'scientifically' and not empirically, in terms of a law of genesis, growth and development. A path of fallen, frozen red Maple leaves slowly slides and eddies before me like a stellar star cluster, while I remain still. Like a La Scala, the old one in Milan, I spend a sleepless night reviewing repertoires, operas, songs, stories, but it's inconclusive. A poetry of what we do in our ordinary hours. I find the process of film interesting, especially relationships between characters-those interconnections, in their imagined and real manifestations. Sometimes (when I make myself get out pen and paper) I pause a film and quickly sketch the characters. 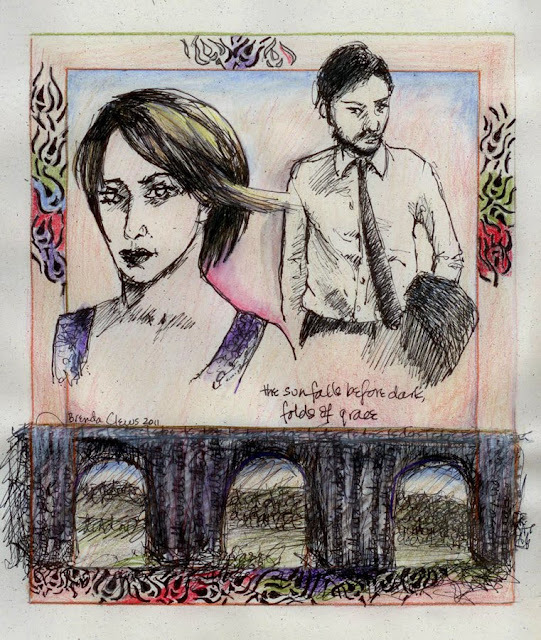 These sketches are not meant to depict the actual film or actors in any kind of realistic way, or even be recognizable. They are dramas, really, to which I add my own words. You can imagine what is happening. If anything, these simple pieces are meant to be evocative: springboards, synchedoches, inductive rather than deductive, they need you to finish their stories. 'The Sun Falls Before Dark,' 17.8cmx 23.9cm, 7" x 9", India ink, pencil, archival paper. 'The Sun Falls Before Dark,' the barebones sketch, 17.8cmx 23.9cm, 7" x 9", archival ink, archival paper. Who are they? what is happening? My wandering thoughts crumble in the reflections of a mirror placed between the snow landscape and white sky. My habit is to turn off the heat every night. After the power failure at dawn this morning, man it was frigid, I am reconsidering. At night I turn off the heat, crawl under a heated blanket. The room air is grey at dawn, the cat, dog and I, shivering, cold, a power failure. ...the wind whispers ice, waves of snow blow, a few streaks of fragile light. These old lovers, a poetics of winter. 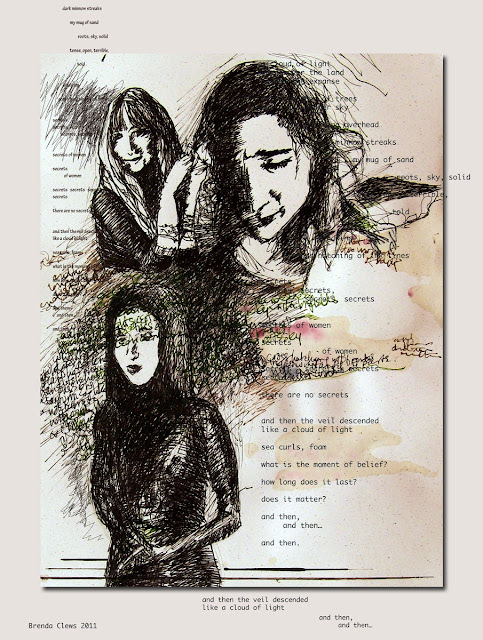 Secrets, 20.5cm x 25.5cm, 8"x10", India inks, archival pen inks, graphite, coffee spill, and some digitally drawn lines as well as text, January, 2011. A voice recording (2:48min) as I was writing the words (you can hear the pen scratching on paper in some of it, my flipping through pages looking for written images, and the slowness of the process of writing). The speaking follows the writing fingers. I'm discovering the story of the drawing, the poetry of it as I write the words which are a mostly unreadable pictorial element around one of the characters like a cloud or veil or tree of words. But I didn't want a drawing of only dream words: words that are inaccessible because the viewer cannot read them.